If you’re not quite ready to cut corners and rappel on 6mm accessory cord, the 6mm Edelrid Rap Line is made for you. Made with super light aramid, the rap line has an amazing breaking strength of 20 kN (4496 lbf) while weighing just 25 grams per meter. It features minimal elongation so you won’t get the bounce effect while rapping. While strong enough to hold an elevator, we think it’s more fun to use it for long missions that involve rappelling but not climbing. Comes in 60m, 70m, and 100m lengths that are simply a joy to carry versus a comparable length of climbing rope. Please check with the manufacturer of your rappel device before descending on line this skinny. Also test your friction in a safe spot before using it in the wild. 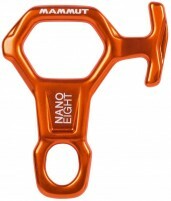 A micro eight plate or an Edelrid Micro Jul make good options, as does a simple Munter hitch. Is the $250 for two ropes? Pretty sure it is for one rope as I've seen it sold by the meter and here it comes in two lengths, and each length is a different color, which is why it is shown in the picture as two ropes. This should probably get added to the description though I imagine people buying this sort of thing will probably see a bunch of warnings: If you're going to join it to another rope for rappelling, tie them together with a double or triple fisherman's knot. Don't tie it with an overhand knot. An overhand knot will not hold. Ah, sorry we missed your question Carl. Indeed, the price is for one rope, and the colors represent the 60m and 70m lengths.